Cobb syndrome, or cutaneomeningospinal angiomatosis, is a rare noninherited disorder first described by Berenbruch in 1890 and described later by Cobb in 1915. Patients with Cobb syndrome present with congenital cutaneous vascular lesions distributed in a dermatomal pattern with associated spinal angiomas or arteriovenous malformations (AVMs). The spinal vascular lesions can cause neurologic deficits, including paralysis. [2, 3] Early recognition of the association between the vascular skin lesions and associated spinal lesions may prevent or minimize neurological sequela. It is critical that the clinician recognize the importance of these cutaneous lesions. Cutaneous vascular lesions. Courtesy of L. Cooke, MD. Cobb syndrome is rare; fewer than 100 cases have been reported. Cobb syndrome is reported more commonly in whites. Cobb syndrome has a slight male predominance. 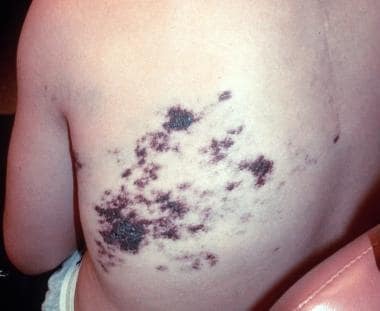 Cutaneous lesions are congenital. These lesions may be subtle, and recognition of the cutaneous lesions may be delayed. The onset of neurological symptoms usually occurs in childhood or adolescence. Patients who develop neurological symptoms may experience intermittent episodes of deficits that resolve, a gradual progressive deficit, or a sudden onset of paralysis. Although the most common timing for the onset of neurological symptoms is in childhood or adolescence, one case report described a 5-month-old infant with a cutaneous vascular malformation and paraparesis. Prognosis likely depends on the severity of the spinal pathology and the timeliness of diagnosis and intervention. Patients who present with rapidly progressing neurological deficits may have a worse prognosis. Early diagnosis is critical. Recognizing the significance of the cutaneous lesions is of upmost importance. Cobb Syndrome should be considered in any patient with cutaneous vascular lesions in a dermatomal pattern. The presence of these vascular lesions in a dermatomal pattern should prompt further evaluation for associated spinal pathology. Diagnosing these patients early may assist in preventing or minimizing potential neurological injury. Owing to the rarity of this syndrome and the varied clinical presentations, multidisciplinary teams may best serve the patient. The clinician should consider consultation with dermatologists, neurologists, neurosurgeons, and interventional radiologists. Cobb S. Haemangioma of the spinal cord associated with skin naevi of the same metamere. Annals Surgery. 1915. 62:641-9. Abtahi-Naeini B, Saffaei A, Pourazizi M. Unusual cause of lower extremity wounds: Cobb syndrome. Int Wound J. 2015 Oct 1. [Medline]. Pal P, Ray S, Chakraborty S, Dey S, Talukdar A. Cobb syndrome: A rare cause of paraplegia. Ann Neurosci. 2015 Jul. 22 (3):191-3. [Medline]. Krings T, Geibprasert S, Luo CB, Bhattacharya JJ, Alvarez H, Lasjaunias P. Segmental Neurovascular syndromes in children. Neuroimaging Clin N Am. May 2007. 17:245-58. [Medline]. Lee JW, Chung HY. Capillary Malformations (Portwine Stains) of the Head and Neck: Natural History, Investigations, Laser, and Surgical Management. Otolaryngol Clin North Am. 2018 Feb. 51 (1):197-211. [Medline]. Clinton TS, Cooke LM, Graham BS. Cobb syndrome associated with a verrucous (angiokeratomalike) vascular malformation. Cutis. 2003 Apr. 71(4):283-7. [Medline]. Matsui Y, Mineharu Y, Satow T, Takebe N, Takeuchi E, Saiki M. Coexistence of multiple cavernous angiomas in the spinal cord and skin: a unique case of Cobb syndrome. J Neurosurg Spine. 2014 Feb. 20 (2):142-7. [Medline]. Shim JH, Lee DW, Cho BK. A case of Cobb syndrome associated with lymphangioma circumscriptum. Dermatology. 1996. 193(1):45-7. [Medline]. Guillet A, Connault J, Perrot P, Perret C, Herbreteau D, Berton M, et al. Early symptoms and long-term clinical outcomes of distal limb's cutaneous arterio-venous malformations: a retrospective multicentre study of 19 adult patients. J Eur Acad Dermatol Venereol. 2016 Jan. 30 (1):36-40. [Medline]. Wirth FP, Post KD, Di Chiro G. Foix-Alajouanine disease. Spontaneous thrombosis of a spinal cord arteriovenous malformation: a case report. Neurology. 1970. 20:1114-18. Salomão R, Canêdo NHS, Abrão GP, Lima C, Acioly MA. Foix-Alajouanine syndrome mimicking a spinal cord tumor. Rev Assoc Med Bras (1992). 2017 Jul. 63 (7):564-565. [Medline]. Jagla M, Szymonska I, Kruczek P. Sonographic findings in a neonate with Cobb syndrome. J Clin Ultrasound. 2013 May. 41(4):258-60. [Medline]. Saraf-Lavi E et al. Detection of spinal dural arteriovenous fistulae with MR imaging and contrast-enhanced MR angiography: sensitivity, specificity, and prediction of vertebral level. ASNR AM J Neuroradiol. 2002. 23 (5):858-67. Dilmé-Carreras E, Iglesias-Sancho M, Márquez-Balbás G, Sola-Ortigosa J, Umbert-Millet P. Cobb syndrome: case report and review of the literature. Dermatology. 2010. 221 (2):110-2. [Medline]. Spiotta AM, Hussain MS, Masaryk TJ, Krishnaney AA. Combined endovascular and surgical resection of a giant lumbosacral arteriovenous malformation in a patient with Cobb syndrome. J Neurointerv Surg. 2011 Sep. 3 (3):293-6. [Medline]. Schirmer CM, Hwang SW, Riesenburger RI, Choi IS, David CA. Obliteration of a metameric spinal arteriovenous malformation (Cobb syndrome) using combined endovascular embolization and surgical excision. J Neurosurg Pediatr. 2012 Jul. 10(1):44-9. [Medline]. Soeda A, Sakai N, Iihara K, Nagata I. Cobb syndrome in an infant: treatment with endovascular embolization and corticosteroid therapy: case report. Neurosurgery. 2003 Mar. 52(3):711-5; discussion 714-5. [Medline]. MRI of spinal vascular lesion. Courtesy of L. Cooke, MD. The views expressed in this presentation are the authors' and do not necessarily reflect the official policy or position of the Department of the Navy, Department of Defense, or the US Government.